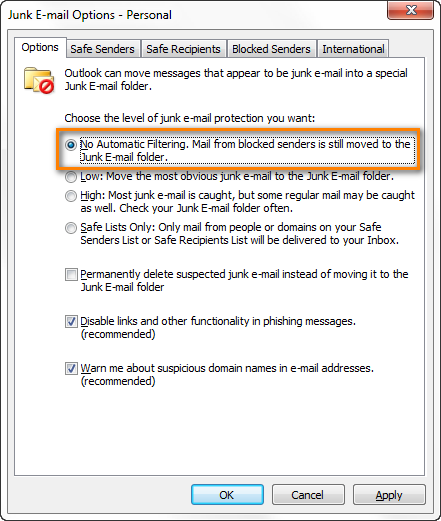 This article explains how to configure Outlook Junk Mail Filter to block as many junk emails as possible. You will also learn how to keep your filter up to date, how to move a good message from the Junk folder and ensure that no legitimate e-mails gets there. The fact is that as long as junk mails has at least a tiny degree of effectiveness, say 0.0001%, spam will continue to be sent in millions and billions of copies. The email protocol was invented by scientists and it could never occur to them that someone would be sending all those car insurance quotes, loans, mortgage rates, pills and diets to unknown people. That is why, unluckily for all of us, they did not devise any mechanism that would ensure 100% protection against unsolicited e-mail. As a result, it is impossible to completely stop the delivery of junk messages. However, you can considerably reduce the number of spam in your inbox by automatically dispatching most of unwanted emails into the junk folder and in this way turn a roaring junk steam into a tiny brook that one can comfortably live with. If you work in a corporate environment, then most likely you already have some anti-spam filter set up on your Exchange server that helps your company to opt out of junk mail. On your home computer or a laptop, you will have to configure the filter yourself and the aim of this article is to help you do this in the most efficient way to stop as much junk email as possible. Before you start setting up the Outlook Junk Mail filter, let me briefly explain, or maybe remind you, some basics of how filtering works. I am not going to waste your time digging deep in theory, just a few facts that you should keep in mind or check before you start configuring the filter settings. The Junk Email Filter moves suspected spam to the Junk folder but it doesn't block junk emails from getting into your Outlook. Junk Mail Filter is turned on by default in Outlook, the protection level is set to Low to catch only the most obvious spam emails. In Outlook 2003, 2007 and 2010, the Junk Mail filter runs before Outlook rules. In practice, this means that your Outlook rules won't be applied to messages moved to the Junk folder. 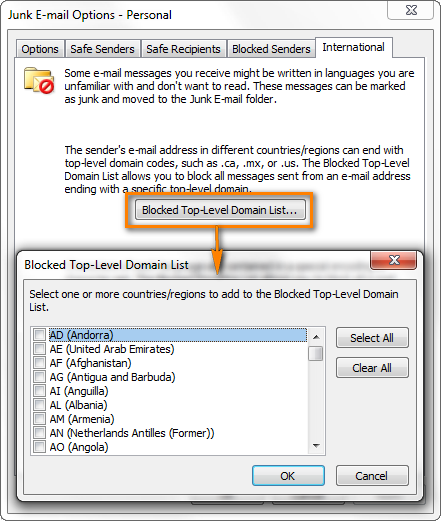 Beginning with Outlook 2010, the Junk Email filter setting are applied to each e-mail account individually. If you have several accounts, the Junk Email options dialog shows the settings for the account whose folders you are currently viewing. And finally, while the Outlook Junk Email Filter protects against much of the spam sent to you, no filter is smart enough to catch every unsolicited email, even if set to the high level. The filter does not pick out any particular sender or a message type, it uses advanced analysis of the message structure and other factors to determine the likelihood of spam. The Junk Email Filter checks your incoming email messages automatically, however you can adjust its settings to give the filter some hits about what should be considered spam. Note: This is just a quick reminder that each email account in Outlook 2010, 2013 and 2016 has its own Junk Mail settings. So, be sure to select a message in the right account before you open the Junk E-mail Options dialog. 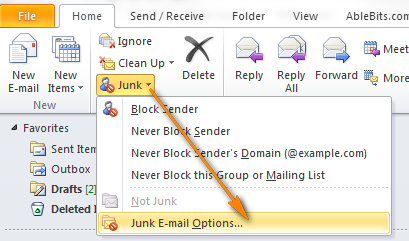 If you use Outlook 2007, click Actions > Junk E-mail > Junk E-mail Options. Clicking the Junk E-mail Options button opens the Junk E-mail Options dialog. The dialog consists of 4 tabs, each purposed to control a certain aspect of spam protection. The tabs' names are self-explanatory: Options, Safe Senders, Safe Recipients, Blocked Senders and International. So, let's have a quick look at each and highlight the most essential settings. No Automatic Filtering. If you select this option, the automatic Junk Email Filter will be turned off. However, if you previously entered some addresses or domains to the Blocked Senders list, they will still be moved away to the Junk folder. See how to turn off the Junk Email Filter completely. Low level. This is the most tolerant option that filters only the most obvious junk messages. Low level is recommended if you receive quite few unsolicited emails. High level. Setting protection level to High is often considered the best practice to obtain the maximum protection. However, along with spam it may also misidentify legitimate messages and move them to Junk. So, if you opt for the High level, don't forget to periodically review your Junk mail folder. Safe lists only. If this option is selected, only emails from people you have added to the Safe Senders and Safe Recipients lists will get into your Inbox. Personally, I cannot imagine a scenario when I would select this option, but if you want this maximum level of restrictions, you can choose it. While the last two options seem to be very reasonable and safe precautions that cannot harm you in any way, I would rather not enable the first option to Permanently delete suspected junk email. The point is that even good messages may occasionally get to the Junk mail folder (especially if you opted for the High protection level) and if you choose to permanently delete suspected junk messages, then you won't have any chance to find and recover a message mistakenly treated as junk. So, you'd better leave this option unchecked and periodically look through the Junk e-mail folder. 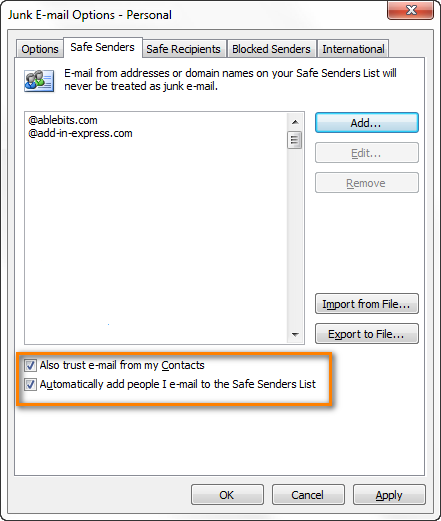 The next two tabs of the Junk E-mail Options dialogs let you add email addresses or domain names to the Safe Senders and Safe Recipients lists. E-mail messages from anyone on these two lists will never be considered spam regardless of their content. Safe Senders List. If the junk mail filter mistakenly considers a legitimate message from a particular sender to be spam, you can add the sender (or the entire domain) to the Safe Senders List. Safe Recipients List. If your e-mail account is configured to receive mail only from trusted senders and you don't want to miss a single message sent to this email address, you can add such address (or domain) to your Safe Recipients list. If you are on some mailing / distribution lists, you can also add a distribution list name to your Safe Recipients. To add someone to your safe list, simply click the Add button in the right-hand part of the window and type an e-mail address or domain name. 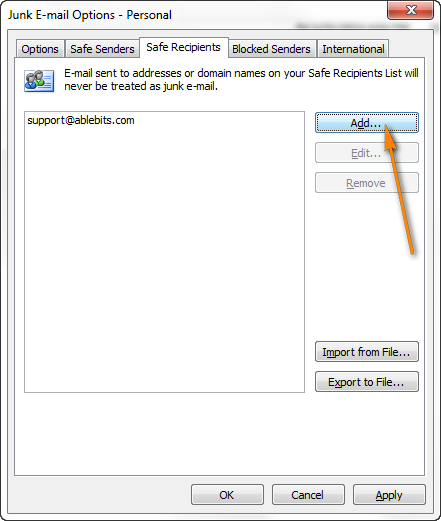 Another way to add a contact to your Safe list is to right click a message, click Junk and choose one of the options: Never Block Sender's Domain, Never Block Sender or Never Block this Group or Mailing List. You can also import Safe Senders and Safe Recipients from a .txt file by clicking the Import from File… button located in the right-hand part of the dialog window. Note: If you are connected to an Exchange Server, names and e-mail addresses in the Global Address List are automatically considered safe. Firstly, because spammers won't typically use the same email addresses twice and adding each address to the Block Senders list is a mere waste of time. Secondly, if you have an Outlook Exchanged based account, the Blocked Senders list as well as two Safe lists is stored on the Exchange server that allows storing up to 1024 addresses in these lists combined. When your lists reach this limit, you will get the following error message: "An error occurred processing your Junk E-mail list. You are over the size limit allowed at the server." And thirdly, when receiving email the first thing that Outlook does is check incoming messages against your junk filter lists. As you understand, the shorter your lists are the more quickly inbound email gets processed. "This is Okay, but what shall I do if I am being bombarded with thousands of junk emails?" you may ask. If all those spam messages come from a certain domain name, then of course, you shall add it to the Blocked Senders list. 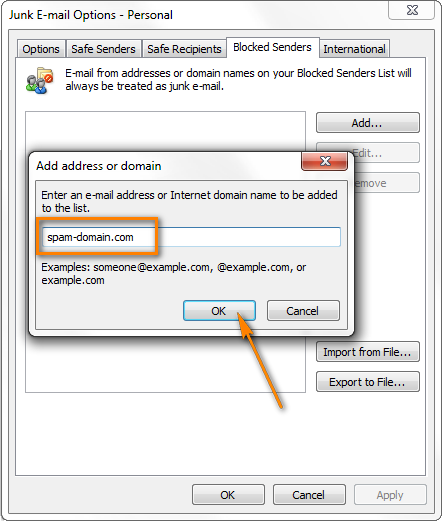 However, instead of right-clicking an email and choosing Junk > Block Sender from the pop-up menu as most people do, block the entire domain using the Junk E-mail Options dialog. At that, there is no need to enter sub-domains or use wild characters such as an asterisk (*). You can ban the entire domain by simply entering @some-spam-domain.com and stop all junk mail coming from that domain. Note: Most often spammers send all those unsolicited emails from fake addresses, different from what you see in the From field. You can try to find the real address of the sender by looking in the Internet Headers of a message (open the message and go to the File tab > Info > Properties). If you do need to block a particularly annoying spammer, you can simply right-click the message and choose Junk > Block Sender from the context menu. Blocked Top-Level Domains List. This list lets you block email messages from specific countries or regions. For example, if you select CN (China) or IN (India), then you will stop receiving any messages if a sender's address that ends with .cn or .in. Though, nowadays when nearly everyone has gmail or outlook.com accounts, this option will hardly help you get rid of many junk emails. And this brings us to the second option that looks much more promising. Blocked Encodings List. 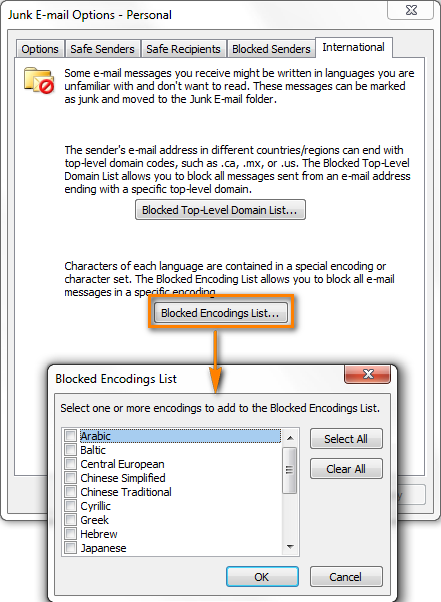 This list enables you to eliminate all unwanted e-mail messages formatted in a specific language encoding, i.e. displayed in a language that you don't understand and cannot read anyway. Note: Messages that have unknown or unspecified encodings will be filtered by the Junk E-mail Filter in the usual way. Most spam is obvious and easily recognizable. However there are some very sophisticated spammers who diligently research Microsoft's junk mail filter technology, elicit the factors that cause an email to be treated as junk and continuously improve their spam strategies. On the other hand, Microsoft takes good effort to fight the latest spamming techniques and adjusts the junk filter accordingly in order to reduce junk email in your inbox. So, it definitely stands to reason to always have the most recent version of the junk mail filter in your Outlook. The easiest way is to turn automatic Windows updates on. 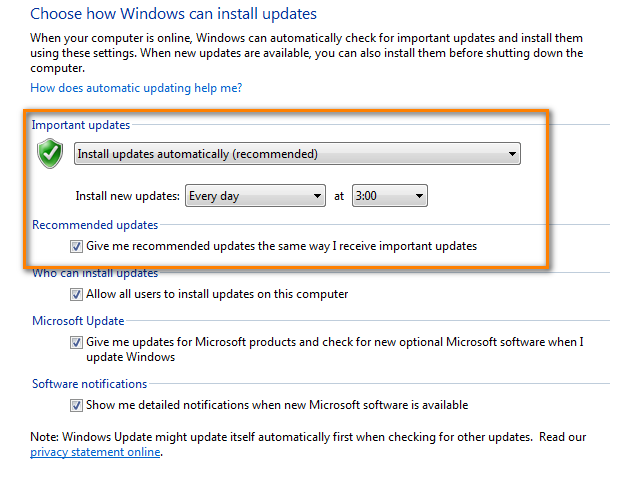 You can verify if this option is enabled on your computer by going to the Control Panel > Windows Update > Change settings. Under Important updates, choose the options right for you. As you can see in the screenshot above, my preference is to "Check for updates but let me choose whether to download and install them". Under Recommended updates, you can select "Give me recommended updates the same way I receive important updates". Note that you need to have the admin rights to be able to change the updates options. As an alternative way, you can always download the latest version of the Junk E-mail Filter for Outlook 2003, 2007, 2010, 2013 and 2016 from Microsoft's web-site. If even the latest version of the junk mail filter does not catch all spam e-mails that get into your inbox, then you can report such messages to Microsoft and in this way help them improve the effectiveness of their junk e-mail filtering technologies. You can do this using the Junk E-mail Reporting Add-in for Outlook, the download links for Outlook 2003, 2007, 2010, 2013, and 2016 32-bit and 64-bit are available here. 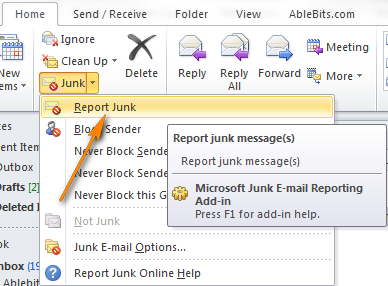 Go through the installation process by simply clicking Next, Next, Finish and after restarting your Outlook you will find a new "Report Junk" option added to your Junk filter. If you have already opened a junk e-mail, proceed in the same way. Right click a spam email and select Junk > Report Junk from the context menu. As already mentioned in the beginning of this article, even good legitimate e-mail may occasionally be treated as spam and moved to the Junk E-mail folder. No one is perfect in this world, nor is the junk filter : ) That is why, remember to check your Junk folder once in a while. How often you do this is up to you. If you set your filter to the High level to stop as many junk messages as possible, it's a good idea to check often. I check it at the end of my work day to make sure I've covered everything. If you spot a legitimate message among junk emails, you can right click it and choose Junk > Not Junk from the context menu. Clicking Not Junk will move the message to your Inbox and provides you the option to Always trust e-mail from that e-mail address. It you select this check box, the sender's address will be added to your Safe Senders list, and the junk filter won't make the same mistake again. If you'd rather not add a particular sender to your safe list, then you can simply drag a message that was misidentified as junk to any other folder using the mouse. Note: E-mails considered as spam and moved to the Junk E-mail folder are automatically converted to the plain text format, any links contained in such messages are disabled. When you move a certain message out of the Junk folder, its links get enabled and the original message format restored, unless the Junk E-mail considers that those are suspicious links. In that case, even if you move it out of the Junk folder, the links in the message remain disabled by default. If important messages that you believe should be in your Inbox often end up in your Junk folder, then you can try to tweak the junk filter's settings as explained earlier in the article. If this does not help and you are still unhappy with the way the Junk Mail filter treats your e-mail, then you can turn it off and use other methods to stop junk email, e.g. third party tools or services. In order to turn the Microsoft Outlook's Junk filter off, go to Home > Junk > Junk E-mail Options… > Options tab, select No Automatic Filtering and click OK. Note: When you select the No Automatic Filtering option, messages from your Blocked Senders list will still be moved to the Junk E-mail folder. Clean your Blocked Senders list. 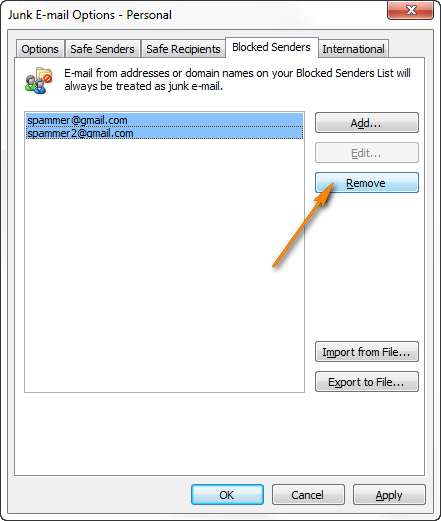 In the Junk E-mail Options dialog window, navigate to the Blocked Senders tab, select all the addresses and click the Remove button. If you think you might need the Blocked Senders list at some point in the future, then you can disable the Junk email filter in the registry. Open the registry (click the Start button and type regedit). If you have Outlook 2013 installed, then the version number will be 15.0 instead of 14.0; for Outlook 2007 it will be 12.0. Right click anywhere within the right-hand pane, add the DisableAntiSpam DWORD and set it to 1 (Value 1 disables the junk filter, 0 enables it). In this way you will have the junk filter completely disabled, including the Blocked Senders list. The Junk button on the Outlook ribbon will also be disabled and greyed out. And this seems to be all for today. Quite a whale of info, but hopefully it will prove to be useful and help you get rid of all those ugly spam e-mails in your Inbox, or at least reduce their number. Just remember that all filters, even the most powerful ones, have some false-positives results. So, simply make it a rule to periodically review your Junk folder to ensure that you do not miss any important messages. Thank you for reading! 86 Responses to "How to configure Outlook Junk Mail Filter to stop spam email"
I have changed the setting to block the junk email as indicated above but that didn't stop the junk emails from coming. I receive 75 or more junk emails per day. Anything else that I can do? I am afraid in this case Outlook's built-in filter won't suffice even if you set it to the High level. You need a more powerful and flexible anti-spam filter. Generally, filters based on Bayesian's algorithm are considered to be the best. Is there any way in which a list of junk mail can be highlighted and all marked as junk? I am getting dozens of unwanted junk/spam emails with the same theme presumably from spoofed or high-jacked email accounts (none are the same sender and all to different names @ my email address) and I am having to mark as junk individually, it would be a time saver to be able to block the lot and have them all marked Junk? I don't think its possible but I thought I would ask! If you are using Outlook 2010 or 2013, you can create a Quick Step to move a message to the Junk folder and assign some shortcut to it, say CTRL + Shift + 1. When you need to mark a bunch of emails as spam, press that shortcut and they all will get to Junk straight away. Regrettably, Outlook does not have any means to automate this process. As an alternative, you can consider installing some third-party anti-spam software with a more powerful spam filter's than Outlook's. For some reason ?? even though I set the junk mail setting to "High" SOMETHING keeps changing it to NO junk filtering. I have done every virus test known to man. I can tell when it happens the spam begins to flood in. Any ideas? Outlook 2003. I can think of just one possible cause. May it be that you have some third-party anti-spam software installed in your Outlook that changes your setting in order to process all incoming email? Please check out your Add-ins and COM add-ins lists (Outlook Menu > Tools > Options > Other > Advanced options...). 2013 Junk Mail options are the worst ever. Even if I check 'Safe List Only' - dozen of repetitive spam crap keeps coming though. Even is I add the domain .me to Blocked senders, emails from .me keep coming right through. After 3 week of this I am fed up and considering going back to Office suite 2010 - which works fine. 2013 seems a can of worms. 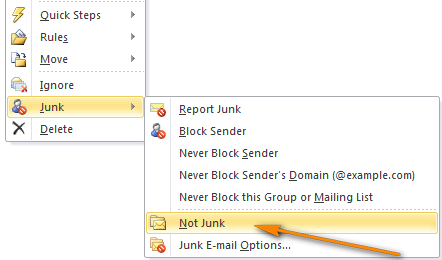 Note: This is just a quick reminder that each email account in Outlook 2010 and 2013 has its own Junk Mail settings. So, be sure to select a message in the needed account before you open the Junk E-mail Options dialog. Do you by chance have yourself in your safe recipients? or maybe have yourself in your address book? Thank you Geoff. That was exactly my problem and I would never have found it without your post. I've got the same problem as John. I have always used Safe List Only because if I don't know someone sending me mail, I probably don't want it. Other than my contacts, there aren't a whole lot of people I want to hear from. But... since I upgraded to 2013, the safe list option doesn't work. I block email addresses but they come through anyway. I block domains but they come through anyway. It's a nightmare. I even switched email providers (from Google to Outlook.com). I'm switching back to Outlook 2010 next weekend. Before downgrading to Outlook 2010, you might want to check one thing, just in case. Do you have your own contact (with your email address) in your Outlook Address Book? If you do, and if you selected the option "Also trust email from my contacts", this may be the real cause of the problem because all emails sent to your address would be considered safe by default. OK. I am going to sound very stupid here, but I do not know how to identify a domain. As you mentioned, spammers may send the same email but from a different email address every time. I think of domain as the part of the email address: @domain.com for example. Well that changes every time. I know that it is one spammer sending thousands of emails to me but I cannot identify that. I did your direction of adding "spam-domain.com" to the block senders section of Outlook but it did nothing. Was that just a generic term and that you really had to know the root domain of the spammer - which is obviously hidden? Any suggestions are helpful. Thanks! This is a very good question! Your understanding is correct, the domain name is part of the email address that comes after the at sign (@), like in your example @domain.com. And yes, I used "spam-domain.com" as the generic term and you have to know the real domain name of the spammer to add it to the Block senders list. As you rightly noticed, most often spammers send their messages from different email addresses each time and quite often these are fake addresses. You can try to find the real address of the sender in the internet headers of a message (open the message and go to the File tab > Info > Properties). Very often the email address you will see there will be different from what you see in the From field. You can check the internet headers of several junk emails in this way and if they all are sent from the same domain name, add that spammer to the Block senders list. I'm getting bombarded by *. *.eu emails. They are changing the domain in all of the junk but, they all end in .eu -- is there any way to simply block that suffix? For some reason, EU is not available in the "Blocked Top-Level Domains" List on the International tab (at least in my Outlook 2013), that is why there is no way to block all emails with the .eu suffix like you can block any other suffixes such as .de, .es, etc. Not sure why Microsoft did not include EU along with all other counties and regions. In this situation, I can only advise you checking out more powerful and flexible antispam software. Sorry for not being able to help better. Thank you very much for pointing to the solution! Thanks for the helpful article. I'm using Outlook for the Mac. I can't seem to get Outlook to stop filtering email to the Junk Folder. Junk Filtering is turned off . . . still, emails (legitimate) are often being sent to my Junk Folder. Any idea what is doing the filtering? I do not have Mac, that is why I cannot advise anything of value. Sorry. I have the same problem as Mark w/ 2013 and the Spam Filter has NEVER worked. Should I just go back to 2010 as I've tried everything else? 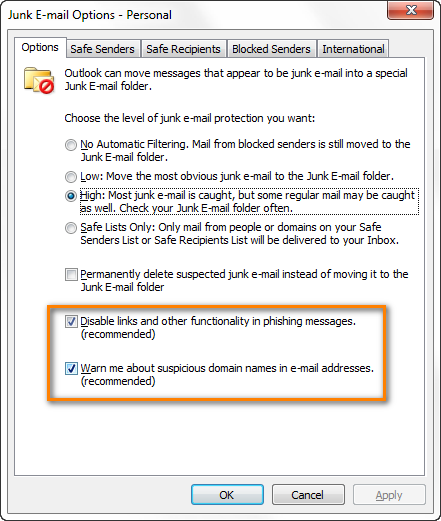 Since each email account in Outlook 2010 and 2013 has its own Junk Mail settings, be sure to configure the junk filter for ALL the accounts you have in Outlook (you do this by selecting a message in the needed account before opening the Junk E-mail Options dialog). is there a way to run the outlook junk processing on your inbox once you've increased the level of checking? I would like to up the spam filter, run it, then check the junk mail box for any senders that I might want to set up as safe. Can I do that? Before when we would report junk mail to Microsoft using the junk mail button in outlook we would get an email within 24 hours from Microsoft about the reported email. We no longer receive those and are getting more and more junk mail and reporting but they are still coming through. Did they stop the acknowledgement? It looks strange, please try contacting Microsoft support service (support.microsoft.com) for assistance. I have a slightly different issue with Outlook 2010 on my note book. I receive mail items through Outlook on my Surface tablet or my iPhone, which I do not receive on my notebook. It does not get filtered to the spam folder, it just doesn't arrive... While this is consistent with some of the senders, often it happens on a random basis with people I correspond with regularly. Check your email settings on your Surface and iPhone. There is a setting about whether to leave messages on the server or not after downloading them to your device, and often times, it will be set to not leave them on the server by default. Messages need to be left on the server in order for your other devices to see them. I have not quite the same problem but one I cant find an answer to anywhere. All my incoming emails are now being marked as SPAM, they dont go to my junk folder, but no matter how often I mark them never block sender (which is the only thing I can find to do) the next time I have an email from that person it comes back marked SPAM. I have to remember to unmark the email when I reply otherwise it goes to them as Spam, How can I stop this spam marking phenonema. Its fairly recent and I use Outlook 2010. 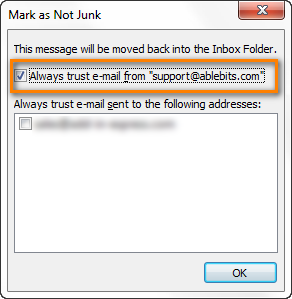 Please send your Outlook rules and Junk Mail filter settings to support@ablebits.com. If possible, please also attach a sample email that is marked as SPAM. We'll see if there is anything we can do to help you. I received junk emails with the sender's name WSJwine almost every day but the email addresses are different. I marked blocking this sender but some of them still come to my in box. Is there any way to specify any email with the sender name WSJwine going to junk email folder no matter what the email address is? I think that Outlook is too stupid to do this simple task. Gmail handles this very well. Surprisingly, Outlook can't block incoming emails by a sender's name. You need a more powerful and flexible anti-spam filter. Generally, filters based on Bayesian's algorithm are considered to be the best. Unfortunately, Outlook does not provide search in the list of blocked addresses. However, the list is sorted, so it may help with finding the right address quicker. You can also export the list to file, edit it in a text editor and save the changes. Then clear the list in Outlook and import the edited file. All of sudden my junk settings became empty.As of my knowledge we will not be able to recover the safer and block sender list. Do we have any other option to recover it ? I have so many personalized setting in my laptop and i am going to replace the same now. How to transfer all the settings in new laptop. Your article is the most comprehensive one on junk email that I've see so far. Great job! I group all the junk emails that I want to block in a folder and I try to click Junk (on the ribbon) and then Block Sender at once. I was able to do this (blocking senders from multiple emails) last week (so I was very happy and recorded the steps) but today, Outlook only allows me to block one email at a time. Very strange. Anyone has any insight? Thanks much! 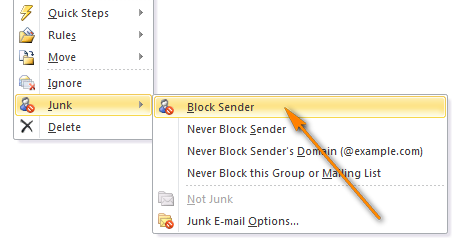 Outlook allows you only to block a particular sender, it does not support blocking multiple emails you select. There are third-party tools that let you do this, but no standard way except for blocking them one by one. Hello, is there a way to ensure that .zip files are not accepted in Outlook? We have a virus that is using the names in our contacts list that sends out emails with a .zip file attached which contains the virus... We have run virus scans, removed the viruses, but yet a name will show up from our contacts and the virus file attached. Please help. how do I stop emails going into the "Unwanted" file tab when they should be in my inbox? Hi, some of my domain emails do not automatically have a junk folder and others do. How can I create a junk folder that junk will automatically go to? Could you please specify if you don't see the Junk Email folder in Outlook? If charlie spammer is sending me emails from ALL of the following (multiple) domains - AND more, do i need to put all those entries in the blocked senders list or is there some shortcut to this madness. I tried putting @domaina.com in the blocked senders list but that does not seem to block any of charlies messages. Any suggestions? If you are being plagued by one particular person or company and outlook's junk filter is not working (usually because the domain changes each time) you should be able to set up a "RULE". Go into rules instead of junk and search for a particular string of letters in the senders address and then simply MOVE it to the JUNK folder. I am looking forward to trying this as I am getting lots of mail from domains like "@mail16.atl91.mcsv.net" where the numbers keep changing every time. Yes it does work. You CAN send mail to the junk folder or anywhere else using the RULES function. You have a lot more options. I have chosen "specific words appear in the senders address" and just entered a text string that always appears. You can even EXclude other specific words if you have a sender that uses the same mailing list that you want to receive mail from. Hope this idea helps someone. Thanks you. I will give it a try. Shame on Microsoft, we need to block what we feel as junk; why do you go backwards? Money of course, you are diminishing your good name.Good luck! Shame on Microsoft, I regret upgrading to Windows 10, it has no junk mail blocking choice, money, of course, you are diminishing your good name. Hi- the junk email setting works fine for me BUT if I delete all the junk emails then the same spam starts coming back into my inbox and once again I have to start adding them to junk email. I would like to be able to filter & permanently delete email based on one word or phrase in the From field. However, Outlook doesn't seem to allow this. It's necessary because while I get dozens of spams containing "aig" in the From field, few are phrased exactly the same, much the way no 2 email addresses from spammers are exactly alike. And "aig" appears nowhere else in the email. I have maxed out the filters on my Verizon account, so that's no longer an option. As I posted above, I have solved this by using the RULES function. You have so many more options. The one I use is "specific words appear in the senders address" and just entered a text string that always appears. Then simply move the e-mail to the junk folder. I have a couple of rules with things like "smdlv.net" or whatever is being used for the mailing list and it is picking up most of the trash. Good luck with "aig"
You CAN send mail to the junk folder or anywhere else using the RULES function. You have a lot more options. I have chosen "specific words appear in the senders address" and just entered a text string that always appears. You can even EXclude other specific words if you have a sender that uses the same mailing list that you want to receive mail from. I have chosen words like "smdlv.net" or whatever always appears at the end. It works. Good luck with "aig"
outllok 2010 does not move junk mail out of my inbox until I click on it. It used to never make it to my inbox. how do I fix it? How can I keep spam mail from going to my iPhone 6 out of Outlook 2010? Everything I have read is the iPhone can't block it only Outlook can. But how? How can we stop international rubbish Mail coming on RSS on Microsoft outlook. This is annoying and jams up your computer.. I have separate 4 separate email POP/SMTP accounts, and all four of them are connected to one OUTLOOK.PST file. So, how can I go and setup each ones JUNK MAIL filter. I seem to be only be able to select for the PRIMARY / DEFAULT one. Please advise me on what I may be missing. I have been receiving more and more junk mail from young ladies wanting to date me. I noticed that their addresses always start with a long list of numbers. Is there a way to set a filter to stop all emails coming from sources with the first 5 characters being numbers? Blocking them individually hasn't stemmed the tide. I noticed that their addresses always start with a long list of numbers. Is there a way to set a filter to stop all emails coming from sources with the first 5 characters being numbers? Blocking them individually hasn't stemmed the tide. Hi and thanks for your invaluable advice. Is there any way to stop the "[unsafe contact]" words being placed into the Subject Line, please. I'm using Outlook Office 365 2016. Junk catches new safe senders emails and then embeds the "[unsafe contact]" words into the subject heading, which then stays there after marking the email safe and returning it to the Inbox folder. Thanks a million in appreciation. I dont have any of those options in my outlook... maybe this is a paid version? Mine is the free one. Hello, I am using office 2013 and I've tried everything to block a particular spam (junkbox@integrity.it). I've block it, made a new rule to delete it and now I have it always in my deleted folder. What to do to make it disappear, I don't want to see it at all. My email address had been put on a junk filter even though I'm not spamming any one. How can i get my email address removed from outlook's spam/junk filter ? how to block emails that have neither a to addressee nor a cc addressee? That is, I have spam emails coming in where both of these fields are blank. All my email goes in the Junk mail folder I have the Exclusive setting ticked. I have no mail filter rules. I am using outlook.com for Chrome os If the Exclusive setting supposed to only allow mail from Safe senders and Safe mailing lists then clearing its not working. I have done verious test using diffent email address I have and added them to the Safe senders list. I have also tried added the eemails to my contacts list but what ever I do makes no difference. So my question is why does Microsoft always write rubbish software. With all the money they get its discusting. Do you not realize there is a MAJOR difference between OUTLOOK and OUTLOOK.COM? Hi team, i have a question why all my sent email goes to junk not inbox but for 1email address only is it means someone block my domain or it might be happen by mistake of recipient? Other people can receive my email only 1adress receiving in junk? May i know the reason why like that? I want to know that is it done by someone who unwanted my email? I have done all the settings as you described, still im getting spam mails in Inbox , Im totally fed up with receiving unwanted mails. After months of struggling with my boss's sent messages ending up in the junk folder in Outlook, I am very relieved to have finally resolved the issue. The culprit was the spam filter on his Samsung (S8) smartphone! For whatever reason, it had identified his own address (and a few other trusted addresses) as spam, and no amount of tinkering with settings in Outlook had any effect. Our fix was to start using the Outlook app on his phone and disable the native email app. I keep getting dozens of advertising spam from sender(s) which have an email such as "lolip19@grandmotherr.ddns.net". Every name is different but the "ddns.net" is common in all of them. I have been trying to globally junk them by using forms of "ddns.net", *.ddns.net", "*@*.ddns.net", etc. but they don't work. How can I junk emails with this double-domain format? 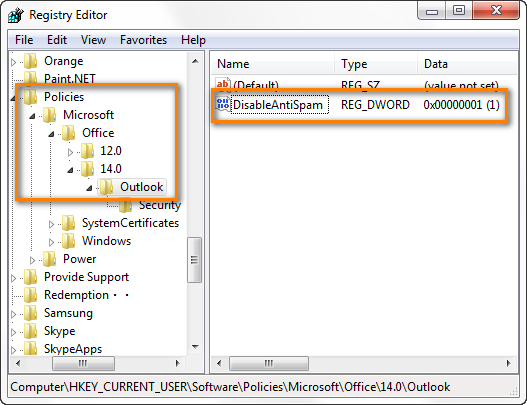 How to prevent email automatically goes to spam in outlook 2013. "Most often spammers send all those unsolicited emails from fake addresses, different from what you see in the From field. You can try to find the real address of the sender by looking in the Internet Headers of a message (open the message and go to the File tab > Info > Properties)."